Nisqually Valley: A man from Yelm died in a car accident on State Route 510 when his vehicle struck a light pole and rolled over. Police are not yet sure why the vehicle left the road or whether drugs or alcohol were involved. The deceased driver was not wearing a seat belt. Yakima County: 8 people were injured in a two-vehicle crash outside Mabton. According to Washington State Patrol troopers, a 17-year-old driver crossed the center line of Glade Road and struck a vehicle in oncoming traffic. One person was injured seriously enough to require transport to Harborview Medical Center’s trauma unit; the 7 others were taken to Prosser Memorial Hospital and Sunnyside Community Hospital. Troopers are investigating whether or not charges will be filed. They do not believe drugs or alcohol were factors in the collision. Vancouver: A driver who rear-ended construction equipment with a minivan on the I-5 bridge between Portland and Vancouver fled the scene on foot, leaving an elderly woman and a young child in the burning vehicle. Members of a transportation crew that had been working nearby spotted the crash and broke a window to rescue the woman and child. None of the transportation crew workers were injured in the crash. Seattle: A crash on southbound I-5 near the West Seattle Bridge slowed traffic to a crawl during the morning commuting hours. A multi-vehicle crash blocked two general purpose lanes and the HOV lane. An additional stalled car on South Spokane Street further snarled traffic for commuters. Edmonds: Two teenagers died and three more were injured in a single-vehicle crash. Their car was on a twisting roadway in Edmonds when it left the road and struck a tree. All of the occupants of the vehicle were teenagers between the ages of 13 and 16. The driver and a passenger in the back seat, both 16 years old, died at the scene. Police do not believe that drugs or alcohol were factors in the crash. They do believe that excessive speed was a factor; the road is nicknamed “old snake road” for its extreme curves that require drivers to slow down. Snoqualmie Pass: One person died and another was seriously injured in a crash on eastbound I-90 near Snoqualmie Pass. Police are looking into the cause of the accident, but their investigation has been delayed because the driver whose vehicle crossed the center line has a serious head injury and cannot speak with detectives. They do not believe that drugs or alcohol were factors in the crash. Auburn: A single-vehicle rollover crash in Auburn left a passenger dead on Monday evening. The vehicle left the road and hit a tree. Police are investigating the circumstances of the crash; they have arrested the driver on suspicion of vehicular homicide. 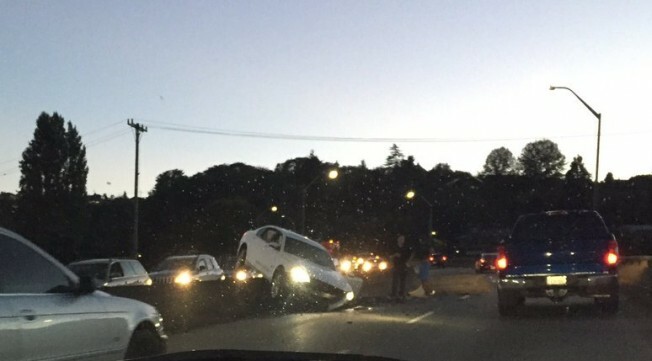 Seattle: A car crash left one vehicle on top of a jersey barrier on the West Seattle bridge. Parts of the jersey barrier were pushed into the westbound lanes, slowing traffic in both directions. Seattle: A rollover accident near Boeing Field stalled traffic on northbound I-5 during the Friday afternoon commute. A trailer/camper rolled over, blocking the three left lanes. Injuries were reported, but they were not life-threatening. Ellensburg: A motorcyclist from Seattle was severely injured when he lost control of his motorcycle on westbound I-90. The crash happened roughly 10 miles east of Ellensburg. He died of his injuries in the hospital. Police are investigating the cause of the crash; they do not believe that drugs or alcohol were a factor, and the rider was wearing safety gear.